Special to The Sun: Benjamin Skrobanek, Clayton Skrobanek getting ready to donate food and pass the crate along to another generous community member to help feed those in need. Despite manicured lawns and quaint storefronts, hunger exists in the community. For six years, members of the Trinity United Methodist Church in Mullica Hill have run a food pantry that is open twice a month to those living in Mullica Hill, Mantua, East Greenwich, South Harrison and Elk townships. Named Your Place at the Table, the food pantry is a nonprofit that operates out of the church. YPATT is launching an initiative this year that Kristen Skrobanek, director of YPATT, hopes will encourage more community members to donate to those “in their backyard,” she said. 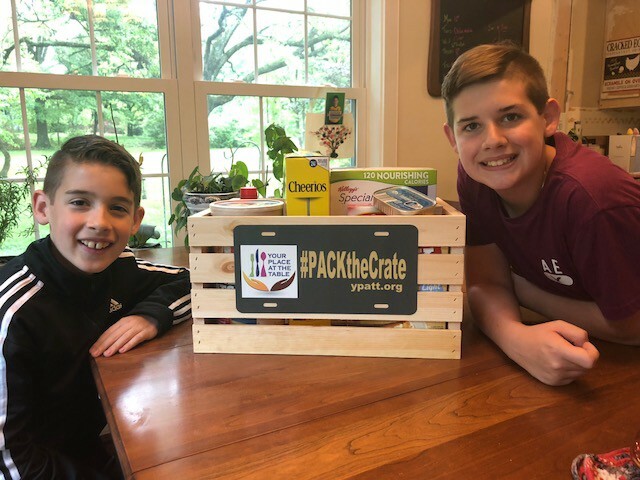 Deemed #PACKtheCrate, the initiative’s design is similar to that of the ice bucket and polar plunge challenges wherein individuals or families will fill a crate with food, post a picture on Facebook or Instagram and tag or “challenge” another individual or family to do the same. Once tagged, participants are requested to fill the crate and take it to a drop-off center (listed below) within five days. Suggested items are: cereal, oatmeal, peanut butter, jelly, pasta, pasta sauce, instant mashed potatoes, canned vegetables, canned fruit, applesauce and pancake mix. In all, 12 crates will circulate through the five communities. The initiative runs through June 17. Before YPATT and engaged in community service, Skrobanek, with family and friends, would collect food and donate to people in the community. However, one day it dawned on her the need for assistance in the community was far greater than she imagined. Running full-steam on the idea there are people in need closeby, YPATT was created and has posted startling numbers. In 2017 alone, 533 meals were provided for community members residing in the above mentioned townships; 23,791 pounds of food were collected; and 1,011 community service hours were recorded. Skrobanek explained 98 percent of food items offered to those in need at YPATT come from individuals, local organizations and the church itself. 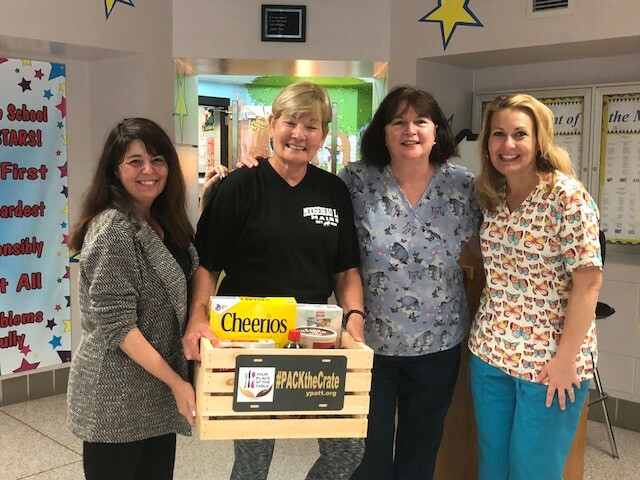 Special to The Sun: Harrison Township School employees Renee Ingiosi, Mickey Fox, Mary Garwood, Andrea Patterson excited to help out and collect food for those in need in their community. “For federal food, we would have to go to a food bank and people would have to qualify,” she said, meaning that to receive food from the government, there are income requirements individuals and families must meet. “The only proof that we need here is that you live within the five communities,” she said. Rather than make it income-based, Skrobanek, along with all others involved, aim to help anyone who needs it: single mothers who need to make it through the month, senior citizens on disability or whose Social Security doesn’t provide for food along with paying the bills and more. With a dose of empathy, Skrobanek says every person who walks through the door can be assured no judging is taking place. Along with continuing to provide for others, #PACKtheCrate is meant to further engage an already generous community, Skrobanek explained. By adding the social media aspect, Skrobanek and the rest of YPATT hope more people will engage with the pantry and become aware that people are in need even right here in this community. For more information about YPATT and #PACKtheCrate, visit https://www.ypatt.org/. The drop-off locations: Trinity United Methodist Church in Mullica Hill, the Harrison Township Municipal Building and Fulton Bank in Woolwich Township.